[Patreon-Nov16-Post-Bug][/Patreon-Nov16-Post-Bug]Today I get to announce the second villain to join the Crushing Comics pantheon of comic guide pages: Magneto, The Master of Magnetism! That’s right, night I bring you The Definitive Magneto Collecting Guide and Reading Order. This new guide is available exclusively to CK’s Crushing Comics Club Patrons until January 15th. Want early access? Visit CK on Patreon to learn more. I’ve long said that of all the Marvel characters who never had their own title (well, until 2014), Magneto’s arc is one of the most consistent and fascinating. 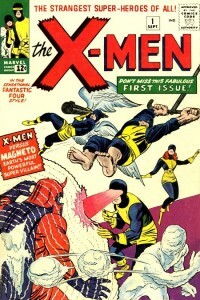 Stan Lee and Roy Thomas had established the allegory of Xavier’s closed hand approach to leading mutants versus Magneto’s closed fist long before Chris Claremont first penned the character in 1975. Magneto transform from a one-note villain in X-Men #1 in 1963 to a man blinded by the frenzy of needing to defend his own people by either establishing a sovereign nation for them or bending the entire world to his will. Chris Claremont made Magneto’s seemingly Sisyphean struggle resonate more deeply when he began to gradually reveal that Magneto was the survivor of Auschwitz concentration camp in Nazi Germany in a series of references and flashbacks starting in Uncanny X-Men #150 in September of 1981. Suddenly, his fervor over leading mutant-kind was contextualized, though it still could not excuse his acts of violence (as in the same issue, when he drowns an entire Russian submarine full of sailors). His repeated attempts to carve out a sovereign, defensible homeland for mutants were suddenly and tragically recast as a way of recreating Israel prior to the World War II rather than after. Marvel really loves to say that each of their annual events “will change everything,” but the original Secret Wars did just that for Magneto in 1984. By grouping him with the heroes in the outset of the story, The Beyonder (and, by extension, his author and editor-in-chief Jim Shooter) recognized the layer of nobility that Claremont had so deftly played up in Magneto’s previous appearance. In turn, that cleared the path for Claremont to begin Magneto’s rehabilitation as soon as he returned from the company’s first line-wide event. He placed Magneto into a sympathetic position, shipwrecked and under the care of Lee Forrester on his own former island base, and then had Xavier personally commission him as the leader of the X-Men in the run-up to Secret Wars II in 1985. That flawed nobility has never since left the character. Even through several later returns to villainy, Magneto’s focus is never pure evil (or, if in hindsight it seems to be, it’s quickly retconned away). That’s partly due to his relative scarcity through 2010. After “Acts of Vengeance” in 1989-1990, Magneto rarely appeared outside of X-books, and was always promptly mothballed upon his exit – as in his memorable turn in Claremont and Jim Lee’s X-Men, Vol. 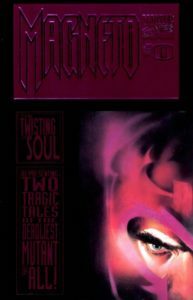 2 #1-3 in 1991. 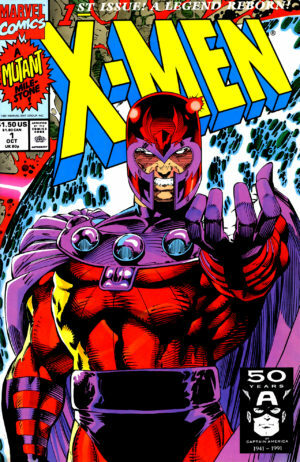 In a March 1999, Alan Davis and Fabian Nicieza finally granted Magneto his wish, with him assuming rule over the island of Genosha off the Southeastern African coast. 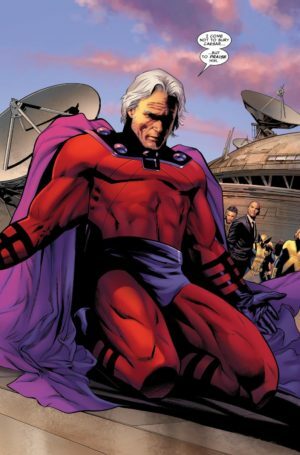 As with the unending holy war between Palestine and Israel, Magneto’s Genosha was built atop the ruins of a country known not only for discrimination against mutants, but for pressing them into slavery and genetic mutilation. It seems that the land is cursed with ill intent, and Magneto couldn’t escape that when a super-sentinel cuts him and his millions of subjects down in cold blood in the shocking opening scenes of Grant Morrison’s New X-Men. Yet, Claremont would find a way to cheat that death (after all, it’s his speciality) in a 2004 iteration of Excalibur, using Magneto as leverage to kick off the House of M event. The wake of House of M left Magneto without powers or purpose, given than less than 200 mutants remained on the Earth. It was Ed Brubaker and Matt Fraction – hot off their co-authored run on Immortal Iron Fist in 2008 – who set Magneto on a new path that culminated in his becoming one of the anchors of the X-Men books from 2010 to the present day. Fraction’s run on Uncanny X-Men saw Magneto reclaim his powers and then submit himself to the service of Cyclops, who had been pressed into leading the entire mutant race past its potential extinction due to the events of Messiah Complex. 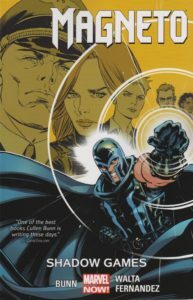 Kieron Gillen and then Brian Bendis loved the subtext of Magneto’s inability to simply play the right hand man, but it was Cullen Bunn who seized upon it in his unexpectedly riveting Magneto solo series in 2014. There, in the vacuum of positive or negative leadership of the mutant race, Magneto began to silence or subvert elements he found unacceptable all while undermining Cyclops as a revolutionary leader through being a triple-agent with SHIELD. The arc of Magneto’s ascendence was so strong that after the line-wide reset of Secret Wars, it was Bunn who was tasked with writing the always-popular flagship of Uncanny X-Men – with Magneto at the helm. That’s a lot of story over the course of over fifty years of Magneto’s publishing life. The Magneto Guide walks you through every issue in reading order, often proving context and major story beats to help orient you to each tale. The Magneto comic books definitive issue-by-issue collecting guide and trade reading order for omnibus, hardcover, and trade paperback collections. Find every issue and appearance! Part of Crushing Krisis’s Crushing Comics. Last updated November 2018 with titles scheduled for release through April 2019. Magneto. He’s the X-Men’s most legendary foe and also one of their greatest allies. He is also one of the most nuanced villains in all of comics thanks to an origin tied to World War II, an old friendship with Charles Xavier, and a persistent goal of protecting mutants from harm. Magneto was a sparsely-used villain in the 20 years from his debut in X-Men #1 in 1963 through 1984. He regularly appeared once every year or so in X-Men, plus had a few exploits with the Avengers and his former recruits, Quicksilver and Scarlet Witch. What changed in 1984 was one major implication of the original Secret Wars, written by then editor-in-chief Jim Shooter. In the mini-series, an all-powerful, all-knowing force named The Beyonder chooses Earth’s most-prominent heroes and villains to fight on his Battleworld. He selects his cast of characters based not on their actions, but upon their intent … and he groups Magneto amongst the heroes. That idea – that Magneto has a noble intent and feels those ends justify his means – has never since worn off the character. After Secret Wars, Chris Claremont had Xavier tap him as a replacement headmaster for the Xavier School. Claremont would eventually turn him against the X-Men again, but his goal was now explicitly creating a safe and sovereign space for mutantkind. Though he would have several more villainous turns, none were pure mustache-twirling – every time it would be grounded in his compassion for fellow mutants. Magneto has suffered many apparent deaths over the course of his career, a tradition stretching back to his earliest appearances and referenced not once but twice by Grant Morrison in his 2001-2003 New X-Men run. He also has a theme of flickering power levels and genetic instability that have played out repeatedly and as recently as Brian Bendis’s run with the character in 2013. Finally, in 2010, the inevitable happened – X-Men’s situation had grown so desperate and Cyclops’s tactics so necessarily ruthless that Magneto joined the team without any need to alter or water down his own ideology. That lead to his longest sustained run as a regular character, as well as his first ongoing series – a character study of surprising depth that elevated Cullen Bunn to writing the Uncanny X-Men flagship with Magneto as its lead character. Due to Magneto’s career as a villain and frequent guest star, this guide is not a straightforward list of issues from runs of singles title. Instead, it tracks every single appearance he’s made from 1963 to present, including flashbacks to his early life. 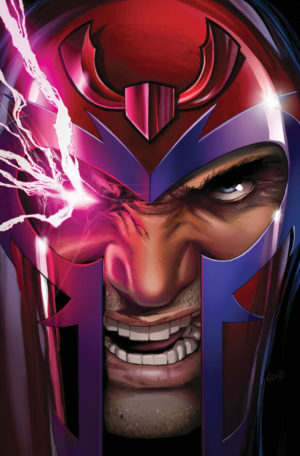 It took 20 years from Magneto to go from his first titled comic to his own ongoing series! There are certain Marvel characters that you probably assume have had at least one ongoing series after four or five decades, but they can sometimes surprise you. As an example, Black Widow didn’t get her first ongoing series until 2010 despite being around since the 60s. Magneto falls into that category for me. When his series was announced as “his first ongoing title” at the end of 2013, I did a double-take – fifty years and no ongoing? Yet, my comic collection tells me it’s true: the Master of Magnetism has had a handful of mini-series and one-shots, including his first – a beautiful, foil-covered affair that I have in mint condition somewhere in my attic. Once that surprise wore off, cynicism wore in. Author Cullen Bunn has been hit and miss with me on his Marvel work, and his hits have been female-driven stories in The Fearless and Fearless Defenders. What could he bring to a Magneto whose motivation and powers were both feeling a little watered down from him playing second string to a resurgent, insurgent Cyclops for the past few years? Would this simply be a movie-fervor cash in with a hunky Fassbender style Magneto staring moodily off into the distance and pulling out people’s fillings? Collecting Magneto (2014) #13-17. Written by Cullen Bunn with artists Javi Fernandez and Gabriel Hernandez Walta and color artists Jordie Bellaire and Dan Brown. #140char review: . @cullenbunn’s Magneto v3 is must-read! A distinct un-@Marvel rhythm & deep story roots give Mags motivation. Herald of good to come on UXM. This is a chilling, down-tempo masterpiece of anti-heroic deconstruction. The only time I was tempted to put it down is to think about it before I turned another page! Cullen Bunn is making Magneto more fearsome and more human than ever, and it’s a compelling read. The cleaner of Fernandez’s art in the first issue are a welcome site as the focus is on the mysterious Briar, wherein Bunn plays a Morrison-like game of building a sub-culture around villainy. If there were super-villains in your world, wouldn’t you be scouring flea markets for DVDs of their greatest destructions after the footage was pulled from YouTube as supporting terrorism? Would people be proud of their scars or angry? This is one of those perfect issues that implies those questions without every verbalizing them, and which deepens the suddenly quite-fascinating mystery of Magneto’s mysterious human benefactor. Afterwards, Walta continues to lend a weariness to Magneto’s chapters with his sketchy lines portraying a certain rough-edged weariness, which Jordie Bellaire has long-since perfected a color pallet to accompany. Here we see Magneto turn on SHIELD after cooperating with them briefly in Uncanny X-Men. What follows is more interesting. Magneto is re-building some semblance of society on Genosha out of a lingering guilt that he’s let his species down. How to even choose the occasion of his deepest regret? Was it the slaughter just perpetrated by The Red Skull on the island? Or perhaps the genocide of millions of mutants in Morrison’s E is for Extinction. Or, were his failures manifest much earlier – during his first overt strike on US missiles during his original encounter with the X-Men and in his guilt for surviving the Holocaust? Some Nazi and Holocaust imagery here is truly nightmarish, but only once does it feel present purely for shock value. What’s so fascinating is that all of our flawed protagonist’s decisions feel right – it’s what you might choose in the position of a beleaguered former super-villain, right down to the shocking final choice he makes to resolve the volume. Bunn’s dissection of Magneto’s extended history feels inspired by James Robinson, who carefully disassembles all things Golden and Silver aged to construct his stories. Maybe Bunn was capable of this all along and never had a character with a rich enough tapestry of stories to draw from. Either way, against all odds Bunn has made Magneto both a nuanced character and a must-read series. If you’re not already excited for him to helm the next volume of Uncanny X-Men headlined by Magneto, then you absolutely must read this book!